The Ural needed breaking in. 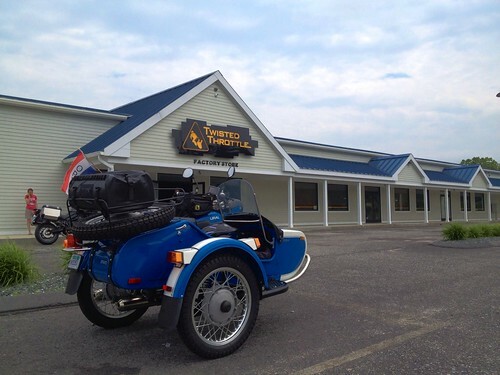 Twisted Throttle had a bag I wanted for the Ural’s rear luggage rack. A plan was hatched. 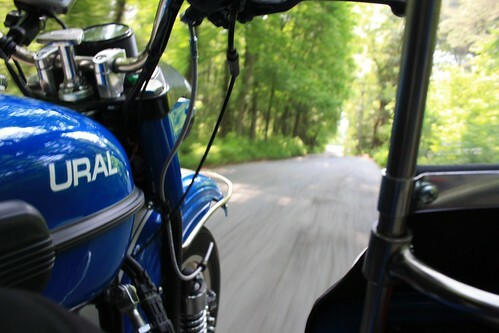 We would use the Twisted Throttle .GPX file to navigate a backroads route from Brookline, just outside of Boston, to the new Twisted Throttle headquarters. It was around 140km to Twisted Throttle. (These Russian bikes don’t speak miles.) We had all day. Left at around 9:30AM after a delicious breakfast. I function best on a bike when I am properly fed, so that was a priority. Because we’re breaking in a brand new engine, we’re meant to ride it at varying speeds, let the engine rest and cool before riding it more, and generally look after it and take it kinda easy – don’t flog it right off the bat. So we left Boston with a few stretches of getting up to 40 or 45MPH, and a fair amount of stop-and-go traffic, as it was a beautiful Saturday. Plenty of people were out and about. I drove down on the first leg, with Kay riding in the sidecar. It was an interesting experience for us. Kay found that he could easily take pictures with his nice camera. And text and futz with the phone. I think he enjoyed it somewhat, although obviously it wasn’t the same as driving. Because the engine should be permitted to cool and not be under too much stress, my plan was to stop at the halfway point to rest it. When we got to roughly 70KM, we’d been riding for about an hour and a half and Kay’s cursory poke at Google Maps didn’t turn up any good locations to stop. So we pulled into a Cumberland Farms gas station, as they tend to have decent amenities, and got off for a stretch and to let the bike cool. All told, we were there probably 25 minutes. We shared a cold juice drink and part of some soda for caffeine, and stood around in the shade, watching all the Harley Riders pause and congregate before riding on. Our Ural was parked at the end of a long row of cars and not really visible from the gas station proper, which makes this the first time we didn’t get anyone coming by to chat with us about it. Hmm. 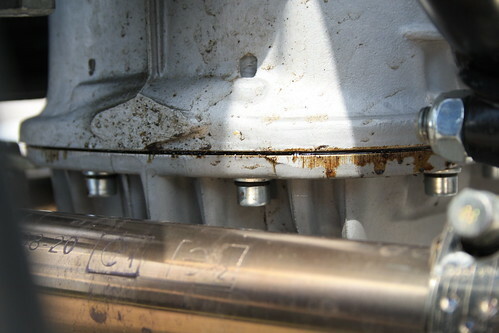 While paused at the gas station, we gave the bike a thorough once-over and noticed a bit of seepage around the oil pan gasket. Checked the engine oil level and it was fine, so we decided to just keep an eye on it and see what it does. I’m taking it back in for the 500km service in a few days so I can ask the shop about it then, but the folks on Soviet Steeds seem to think it’s probably just some gasket sealant seeping as it isn’t the right color for oil. Back on the road after our gas station stop, and the bike felt different. Everything felt looser. I don’t know how to describe it to someone who has never broken in one of these bikes, but the engine just seemed to run smoother. It wasn’t pushing as hard to do everything. It was just… better. The second half of the trip to Twisted Throttle was WAY better than the first. Lots of backroads, pretty wooded bits and the small towns were fewer and farther between. I got a lot of practice handling the bike on twisty roads, and am now much more comfortable with it in turns (although I still reflexively slow down before right-hand curves). Had the bike from around 25MPH to 45MPH, with a couple of short stretches up to 55MPH. It was glorious. A lot of fun. And while it was still a fair amount of work to manhandle the thing around, I didn’t feel as tired in my upper body afterwards (although for some reason, my thighs are a bit sore today). Arrived at Twisted Throttle very cheerful. (Kay, in the meantime, spent the last 20-30 minutes of the trip napping in the sidecar. I asked him to kindly not fall out, and kept an eye on him while driving, but all was well.) It took about 3 1/2 hours or so to get there, including our half hour stop at the halfway point. Bought our bag, which is just awesome on the rack. It’s a rigid dry bag system with a roll-down top, and you can attach a smaller bag to it if you need extra storage. The rigidity of it makes it tie down extremely securely to a Ural luggage rack, even when the bag is empty. The fact that it’s a dry bag means we never have to worry about rain covers, and because it’s motorcycle-specific, it should hold up better than my cheapy Outdoor Research drybag did on our Americas trip. And there appears to be just enough room on the front to carry our tent, although we haven’t checked that yet. I’m really happy with the purchase, and as always, the guys at Twisted Throttle were awesome to deal with. They really go above and beyond. They’re one of the companies we really love (like RevZilla!) Can’t recommend them highly enough. We were at Twisted Throttle for just under two hours, between drooling over stuff we want for the Ural, chatting with Terry and wife who we ran into there (hi guys!) and installing the bag on the rack. The engine felt cool to the touch at that point, so we judged it rested enough to set off on the return leg! Kay drove home on the return, and I rode in the sidecar. (The idea is that we get roughly the same amount of experience riding it, and trade off, so we’re equally skilled at handling the rig.) Kay immediately commented on how different the bike felt than it had Friday, when we picked it up from the dealer. I’d told him that everything really felt looser and smoother after the gas station stop earlier in the day, but he was unprepared for how dramatic the difference was. The way this engine literally bores itself out while driving it is just kinda freaky, but in an awesome sort of way. The only unpleasant surprise was when we fueled up a few KMs after leaving Twisted Throttle, and discovered that we’d only gotten 23.68 MPG on our first big ride! OY! People on the Soviet Steeds forum generally report getting around 30 MPG on these things – it was an unpleasant surprise compared with the 55-60 MPG we get from the Beemers! Back on the road, and I got a real taste of riding in the chair while Kay was driving the rig. It’s a totally different way of traveling. 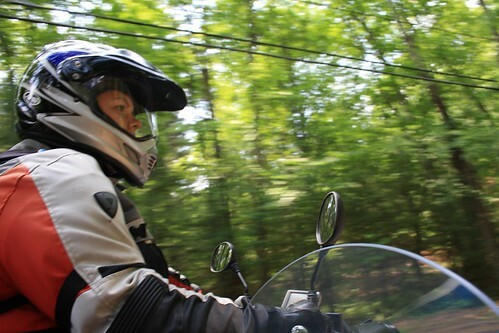 You get the open-air experience of motorcycling, without having to worry about holding on, and with a clear view of the road ahead. It’s WAY better than riding pillion, which I am extremely reluctant to do (to the point that I’ll rent a car instead of riding pillion if that’s my only choice) because there isn’t a big helmet in front of your head, you don’t have to worry about hanging on, and you can really look around and enjoy the world. I was surprised by how much I liked it. I thought I’d be kinda frustrated and bummed that I wasn’t driving again, but it was fine. And honestly, don’t tell our Beemers, but I could see going around the world like that, trading off driving, if it weren’t for the fact that the sidecar is ultimately earmarked for the dogs. Stopped a little past the halfway point for some late lunch at around 4:30 to let the engine cool off again. Back on the road, and we didn’t get home until around 7PM. The return leg of the trip with Kay driving took around 4.5 hours. It was almost exactly the same mileage, although the route was slightly different because he missed a few turns and routed a different way. After fueling up near our house, we discovered we’d gotten 24.24 MPG this time – slight improvement. Whether that’s because the engine is gradually breaking in and requiring less fuel (i.e. energy) to literally bore itself out, or if it’s because Kay was driving less aggressively, it’s hard to say. I’ll be curious to see if our mileage improves more as it breaks in. All told, we did around 280KMs, and unfortunately that put us at around 480KMs on the bike. The 500KM service is supposed to be completed between 500-600KM, and the dealer is around 45KM away, so we really can’t do any more driving on the thing until after I take it for the 500KM service. We snuck in a ride with the dogs today which added about 15KMs – so we really can’t drive it more until after it’s serviced. Which is a pity, because I’m completely hooked!